Ah it’s September. I love and hate this month, because well – it signals the arrival of Fall, my favorite season, but it also signals the arrival of another birthday. 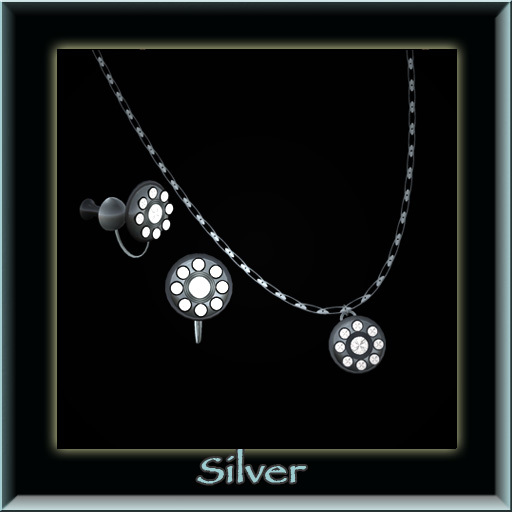 To celebrate I’ve put out a lovely group giftie in the good ole subscribe-o-matic, if you’re not a group member, here’s the slurl, stop by and join today! You can grab it from history – it’s free! It’s my new Heart Charms necklace and I’ll probably get around to making it in different metals with matching earrings someday! Oh and a big squaaaa-weeee-allll…..I’m on the Closet Crisis website as a guest submission!!! Thank you Hethr for posting my outfit!!! Here’s a pic of the group gift, with the lovely new Hailey hair from Tousled, Curio Lumine Fresh I (Leaf), my own catty eye sunglasses and Dernier Cri’s Belted Top, Green pattern. Getting married? I did – it was a lovely SL ceremony involving emails sent back and forth between me and my longtime RL partner ;-). Getting married? Well even if you’re not, you’d prolly be interested in taking a look at my lovely selection of pearl sets. All pearls, all the time! I just love pearls – and well I gots lots of them this week. A lovely brand new style called ‘Starry Pearls’ set in Gold, Silver and Copper. 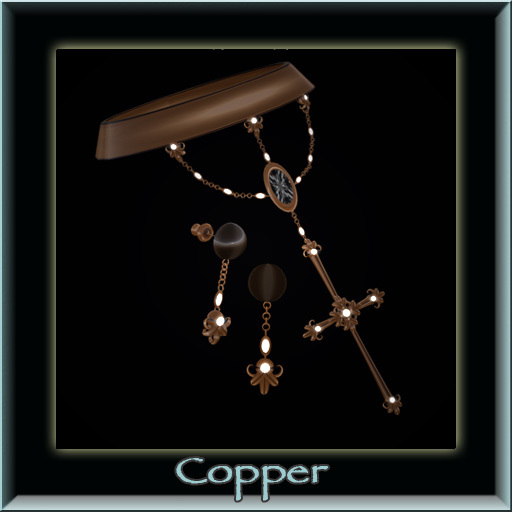 I’ve also redone two of my other other popular pearl sets, the classic “Pearl Drop” set and ‘Swirls of Pearls’ set, in Gold, Silver and Copper. Next up – a redesign of a popular sandal that I gave away as a freebie one week, the ‘Chunk Sandal.’ It features a a lovely leather in Black, Brown and Red with a metal strand holding it together. Looks great – but since summer is almost over, I’m putting all three sandals and colors out for $100L! And finally – belts. I gots them, lots of them. I’ve decided to have a special SALE on them – 1/2 price on all belts. You get different color options in every pack. Originally a great deal at $100L – now an awesome deal at $50L. The SALE is on at all my stores and ends on 8/26/08 at 5:00 p.m. SLT – here’s the slurl to the front door! And here is the newness! Why oh why can’t I have more freckles? One day, I was surfing happily along on the feed, and suddenly I was stopped dead. The Gala skins. Don’t go look, don’t go look I told myself – and absolutely, positively, no demos. I listened to the exclamations on FCC and ignored them. Not my prob, nothing to do with me, I thought. I stayed away for two weeks. Then I went JUST to get a couple of demos, cause I was certain I wouldn’t like them. I got the demos and tried them on – purposely got a tone I knew I wouldn’t like (oh the games we play). Um, then I went back to get them all. Then I hemmed and hawed. Well they look nice, but how can I possibly tell with the demo thingy in the way, I thought to myself. I hedged around on FCC. Anybody got Gala skin, I asked. Of course they did. Finally I discovered, AH HA! There are only 4 skins with freckles! WHAT? OMG, how will I buy every makeup with freckles ever made? More serious consideration occurred as another week or so passed. Finally I couldn’t stand it anymore. I went and bought. The Curio Lumine-Freckles I Pack with four makeups is mine….I seriously love this skin. I mean I lurve it. I must have more with freckles, but right now I’m considering the fact that there are not more available with freckles as the savior of my current linden balance….oh, did a bit of a mashup too, with stuff I consider oldies (okay, not that old) but goodies. Credits below the photo!! Hair – ETD Sea Nymph Hair II Ltd Edition – Sea Flame – No longer available. 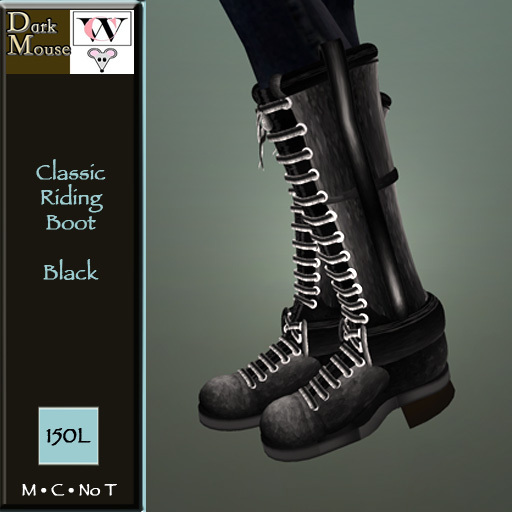 Newness: Classic Riding Boots and SALE! Okay so I did something I’ve been wanting to do for a long time, and will confess, it took up every ounce of my time! I spent a long time on these boots and like them very much. They are partly regular prims, part sculpty, meaning they load a bit faster than a full sculpted boot. I also wanted to give everyone a chance to take a look at all the unique bangles and bracelets I’ve created over time – so I’m having a 50% off sale on ALL my bracelet sets. Most include right and left bracelets, matching earrings and come in different colors! So what was once a great deal at $100L is now an AWESOME DEAL at $50L. This sale is ONLY AT MY MAIN STORE IN TABER and WILL ONLY LAST TILL SUNDAY EVENING (8/17 – 5P.M. SLT). 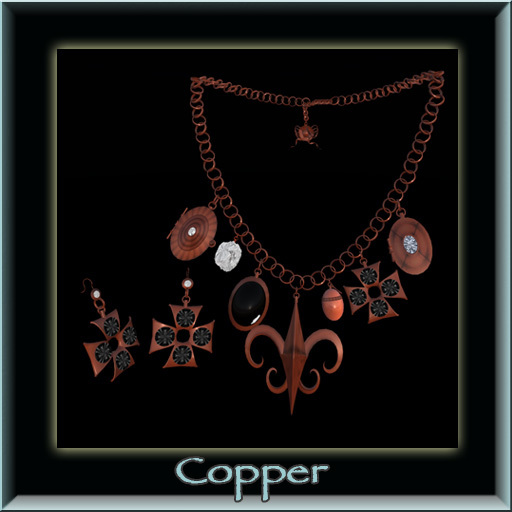 Oh and don’t forget – the August FREEBIE is still out for you to grab in addition to my lovely fleur de lis necklace, sitting right there on the coffee table of my main shop…..
PLUS I want you to visit my lovely main store so the sale is only at the main store! Here’s your teleport directly to the front door of the store. Feeling a bit outta it? Need a little excitement? How about a treasure hunt, new releases and a Group gifty available for everyone!!! Well in Bricolage from Friday, 8/8, 12 p.m. SLT to Sunday 8/10 7 p.m. SLT there is the ‘one av’s trash is another av’s treasure hunt!’ There will be garbage cans and treasure chests hidden all over the sim. In the treasure chest, you are guaranteed to get, well, treasure! In the trash can you’re gonna get, well hmmm, something maybe a bit on the funky side ;-). Think ‘white elephant’ and what the heck you may LOVE it! OMG what are you waiting for? Get over there now! Here’s your instant gratification teleport! OH I also have new releases – I have some unusual stuff – my lots of holes belt (oh imagination, where are you hiding?) and a lovely set of bangles, called brown pattern bangles and beads (yes, even more original). The belts are awesome and different. You get two colors in each box for $100L. Brown and Black or Red and Green. The bangles are different too. 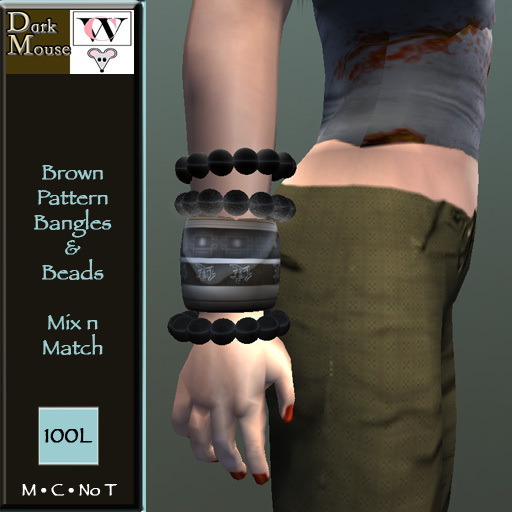 I made the bangles combined as beads and cuffs, or just cuffs, or just beads, so you get a lot of different looks for your bucks…How do you get there? Tp directly to Dark Mouse! And last but not least – I went on vacation, put a present in the trusty subscribe o matic for my group, and low and behold the darn thing wasn’t working properly. Sooooo I put the August group gift out on the coffee table for EVERYONE to grab! I’m also transitioning my stuff to new vendors that feature new metals, and new fatpacks specials (a 30% discount, such a deal!). Here’s a look at all the newish stuff.